That stereotype is belied by the fact that from those very same oft-derided kitchens, devout Catholic mothers were studiously launching a bold counter-cultural crusade against an increasingly secular and commercialistic society. They did so by researching and then creatively applying the Church Year to their homes, actualizing the principles of the Liturgical Movement, and inventing what we might call Rituali Domesticorum: family-oriented paraliturgical ceremonies that included prayers and devotions, traditional recipes, hymns, and crafts. Family devotions and an excerpt from a ritual for evening Christmas prayers. From Helen McLoughlin's Christmas to Candlemas in a Catholic Home (1955). 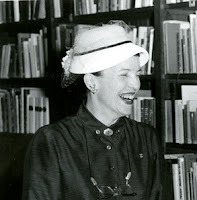 As Katherine Harmon has documented in There Were Also Many Women There: Lay Women in the Liturgical Movement in the Liturgical Movement in the United States 1926–59, the Liturgical Movement had been discussing the necessity of regrounding family life in the liturgy through the 1930s. The promoters of this idea were at first mostly priests and religious, although women were also involved early on. 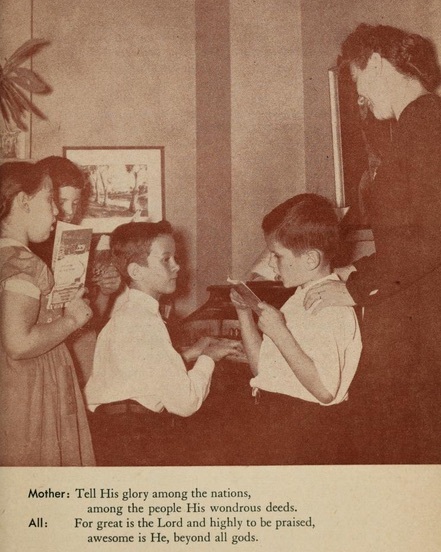 Dr. Therese Mueller, who emigrated from Germany with her husband in the mid-1930s, was one of the early lights of the movement, publishing her Family Life in Christ in 1941. 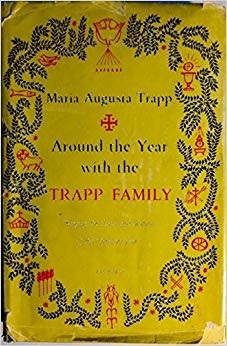 Having watched European parents relinquish their children’s Catholic upbringing to religious institutions, only to see the secularization of those institutions, she was keen on giving Catholicism a solid grounding within the home, including celebrating feasts, praying the Office, and maintaining a home altar. Mueller popularized the German Advent Wreath in the United States and helped standardize its violet and pink candles as an antidote to the “horrible, secularized, commercialized Santa Claus, more and more shameful each year”. Women brought a particular genius to this movement—the application of the Liturgical Movement’s principles into the domestic sphere. When Rev. Francis X. Weiser, SJ (1901-1986) published his Handbook of Christian Feasts and Customs in 1952, his book was rather more historical and ethnological than practical. It was certainly an excellent work that served many later authors as an important source for the folklore of feast days. Yet it did not offer a useable Rituale itself. “Great leaders are men of vision who can point out a path of action with the surety of a prophet. Faithful followers may often be women who appreciate the revelation and set their feet upon the new way in trust and love. It sometimes takes years for the following in practice to catch up with the leadership, but women are notorious for bringing the stars down to earth and centering all ideas in themselves”. 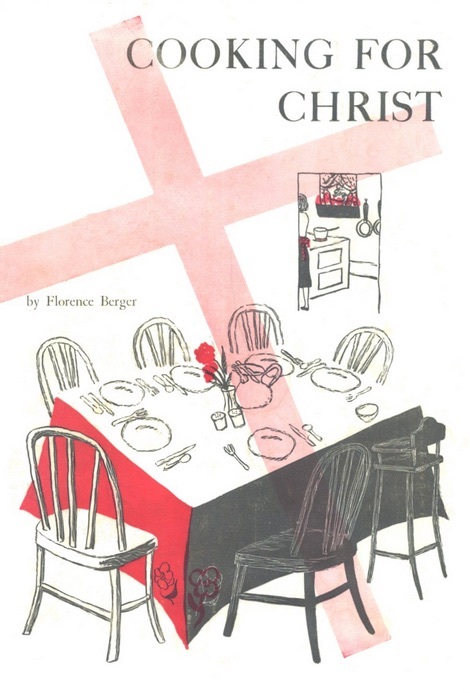 Berger is best known today as the author of the immensely creative Cooking for Christ: The Liturgical Year in the Kitchen (1949), which was not only was an influential work to many of the women who followed her but also served as a required textbook for many Catholic schoolgirls. Indeed, the American melting pot seems to have been crucial to the development of this movement. While Old World Catholicism was packaged in discrete cultural units that were transmitted (or abandoned) entire, American Catholicism by this time comprised a hodge-podge of ethnic influences from just about every corner of Europe and a few other cultures as well. All these discrete cultures then jumbled together, setting the stage for a reassembly of their constituent components, where German Christmas trees and Advent wreaths could be combined with the English Yule logs and the Italian Presepio. Another notable author, though less famous, was Helen McLoughlin. 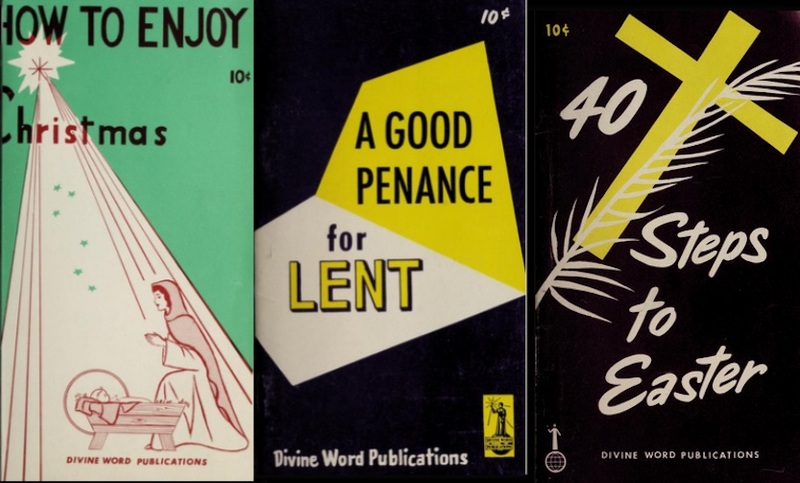 Her booklets have not, to my knowledge, been reprinted very recently, but they certainly deserve to be better known: Family Advent Customs (1954), Christmas to Candlemas in a Catholic Home (1955), Family Customs: Easter to Pentecost (1956), and My Nameday—Come for Dessert (1962). Many of the prayers we use in our own family rituals were taken verbatim from her work. 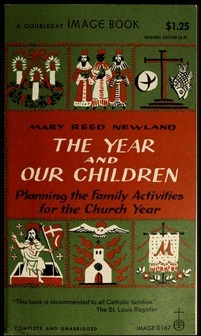 Mary Reed Newland's landmark The Year and Our Children (1956) is still in print and available from Sophia Institute Press. Newland's is a thorough, book-length treatment of the liturgical year, and it even treats holidays such as Halloween and Thanksgiving, which has no doubt contributed to the book's continued popularity. Describing her family as "stirred by an uneasiness that was hard to define" and as missing a connection between doctrine and application, she found the solution in living the Church's year and allowing the Christian seasons to shape her family's domestic life. "What we sought was a way to combine all these things harmoniously so that they would make a life for our family that was wholly Christian and would allow us to grow in the knowledge and the love of God in the times in which we live." Anticipating certain objections to what she and other mothers were doing, Newland then offers an apologia for her domestic rituals and crafts, sounding an incarnational note that would be a worthy defense of Catholic art in general: “Some might protest that this is not really praying with the Church, this making of wreaths, baking of cakes, crowning of kings, dressing of dolls, cutting, pasting, sewing, planting; that this is not prayer of any depth and certainly not the liturgy of the Church. No, but for people who are learning what the liturgy is, and how to follow the prayer of the Church, who are making their first attempts really to pray it, this is the way to learn.…These delightful things to see and touch and smell and taste and hear and make and do are by far the best tools there are to teach of the beauty and power of God, and the richness of life in Christ." There were spiritual mothers who contributed to this domestic ritual movement as well; their emphasis was different, of course, but their goal to sanctify family life were the same. Sister Mary Theresita, SSJ brought her teaching, sociology, and surveying experience to a number of booklets on the liturgical year in the family, including A Good Penance for Lent (1959), How to Enjoy Christmas (1960), and 40 Steps to Easter (1962). In general, the prayers used in these publications are of high quality, with obvious nods to the Missal and Breviary. Moreover, they retain the stately hieratic English that was common before Vatican II. It would be an interesting research project to parse out their sources. For example, the blessing of the Advent Wreath, printed in both McLoughlin and Newland and then spreading far and wide, was not written by either author but came from a pamphlet “The Advent Wreath” published by the Conception Abbey in Missouri. The abbey had begun a monthly Altar and Home in 1934 to make the liturgical year and its various devotions better known among Catholic laymen. It's remarkable that these books continued to be reprinted through the decidedly anti-traditional 1970s, as the rapid degradation of institutional Catholicism in America made the problems of commercialism and secularism all the more acute. And today, whole new generations of devout Catholic women are eagerly reading these domestic Rituali of the 1950s, adapting them to their own homes, and sharing ideas with each other online. The rise of homeschooling in the U.S. has also, for many, made the home the primary vehicle of Catholic education, as the Liturgical Movement had envisioned. In hindsight, the mothers of the ‘50s were proved absolutely correct about leaving religious education in the hands of institutions, and they should have been heeded earlier. If we are tempted to romanticize the robust Catholicism of the 1950s, we would do well to ask ourselves a question. Why were the problems these women confronted, and the solutions they offered, so amazingly applicable to our own era, where we now face a desolated, perverse cultural wasteland and Religio Depopulata? It is certainly because they were able to see, even in that outwardly healthy Church, the fatal seeds that were already undermining its foundations. Overall, these authors were both far more bold and far more prescient than many moderns would give them credit for. And without quibbling too much with Florence Berger's assertion that her contemporary Catholic mothers relied on “men of vision who can point out a path of action”, our generation has not only a path of action thanks to these women but also also an inspiring and edifying vision of the Catholic home that will continue to bear fruit in Holy Mother Church for years to come.